Kathleen Shannon and Emily Thompson are self-proclaimed "business besties" and hosts of the top-ranked podcast Being Boss, where they talk shop and share their combined expertise with other creative entrepreneurs. Now they take the best of their from-the-trenches advice, and give you targeted, actionable guidance on:* Cultivating the Boss Mindset: weed out the distractions and get focused on what you want* Mastering Boss habits and routines: including a "magical" way of mapping out your goals for amazing results* How to stop freaking out about money and sell yourself (without shame)* Living the Boss Life (it's not all about work! 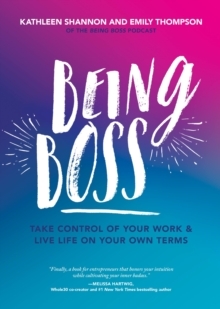 )Being Boss gives you both hard-hitting business advice along with inspiring lessons on self-care and finding balance. With worksheets, checklists, and other real tools for achieving success, here's a guide that will truly help you "be boss" not only at growing your business, but in every aspect of your life.